"We just wanted to inform you that one of our own CCHS artists, Kaylee Brewer, received the highest award achievable for the Scholastic Art & Writing Awards...GOLD KEY...for a piece she entered into this competition!!! 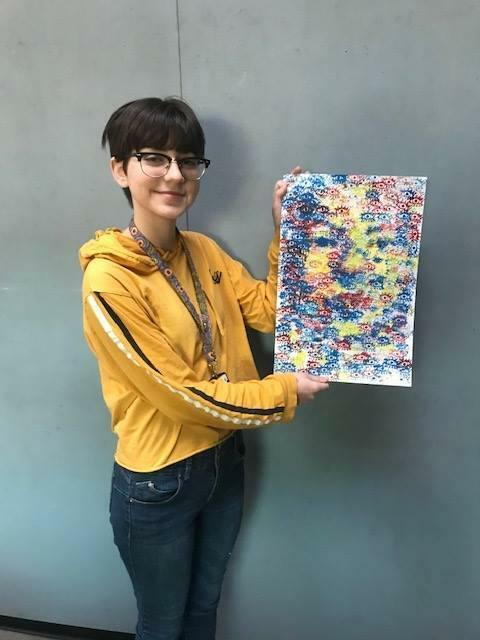 We did printmaking last semester in our AP Studio Art class and she took printmaking to a whole new level, experimented, made several pieces, and finally created her award-winning piece. This is a FIRST TIME EVER award for a CCHS art student! This is a huge achievement because she competed against our entire STATE to earn this gold key award...and only GOLD goes on to compete at the national level, so she has the opportunity to earn an award at the national level as well. "Printmaking is an art method of printing multiples of the same art piece (monoprinting excluded) - and there are many types of printmaking. Block printing was the method Kaylee used by carving into a linoleum-type material (she carved several types of eyes) and then printed them over and over. Usually with block printing, the image you carve creates the complete image of the art. Kaylee decided to go beyond tradition and use the printmaking method to "build" a full self-portrait out of individually printed eyes...giving a sort of impressionist or pointillist effect where standing back from the piece allows you to see the portrait, and viewing up close allows you to see the individual eye details. The piece is called "All Eyes on Me" relating to her concentration concept of defining 'self'...a look into how we come to be who we are over time and through life experiences. With this piece, she's exploring how we often define ourselves by how others view us."